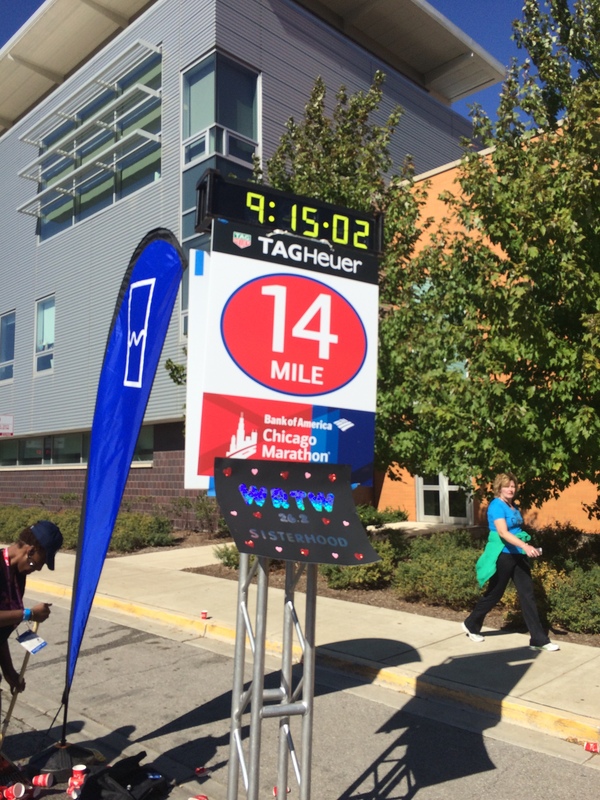 The fourteenth mile went by pretty quickly to me. I was still keeping all of my run/walk intervals going. We were leaving the city. However, the crowds still were there for us. 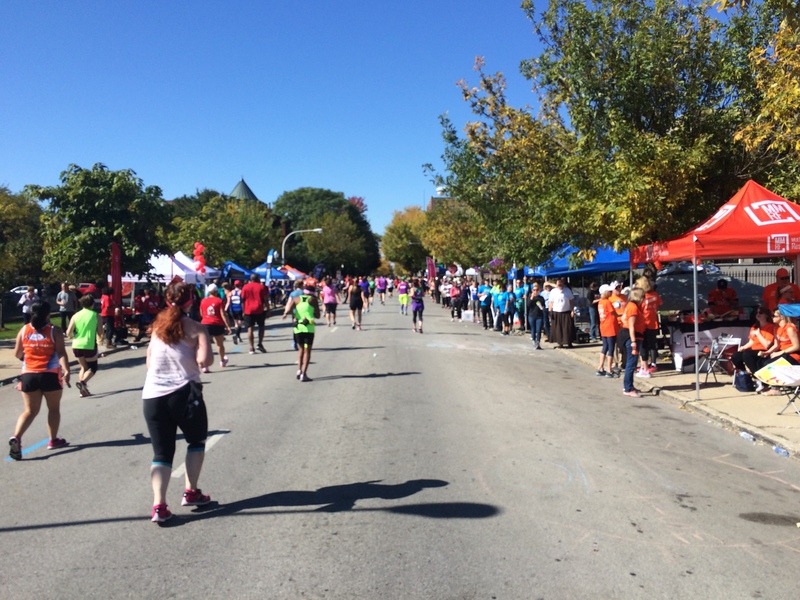 In the fifteenth mile, there was this stretch where some of the larger charities had tents set up to cheer their runners on. I knew beforehand that my charity would’t be among them. However, I’m sure that the runners for these charities appreciated the support. 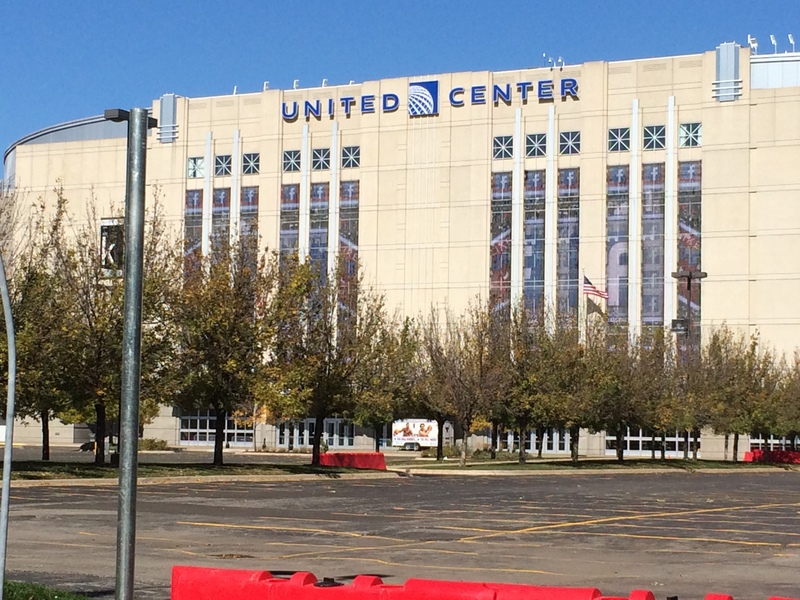 Just past the charity section, I saw the United Center, home of the Chicago Bulls and Chicago Blackhawks. As a big basketball fan, it was cool to me to see the house that Michael Jordan built. We were on the wrong side to see the statue of MJ. However, it was still fun to run by. After all, this was the only stadium we’d get close to. Two turns later, we were running back towards the city. 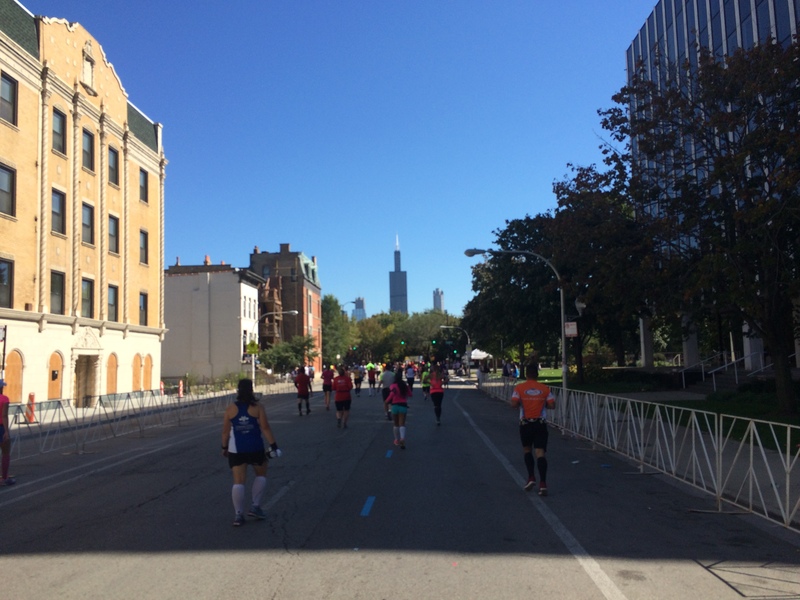 You can see the Sears Tower…I mean the Willis Tower…ahead of us. We’d see that for quite some time. I must have missed the 15 mile marker. Oops. Once I got here, I knew we were getting down to single digits! With each run interval, I told myself that I was less than 10 miles from the finish. I was begging my body to carry me to the finish and I would never put myself through this again. 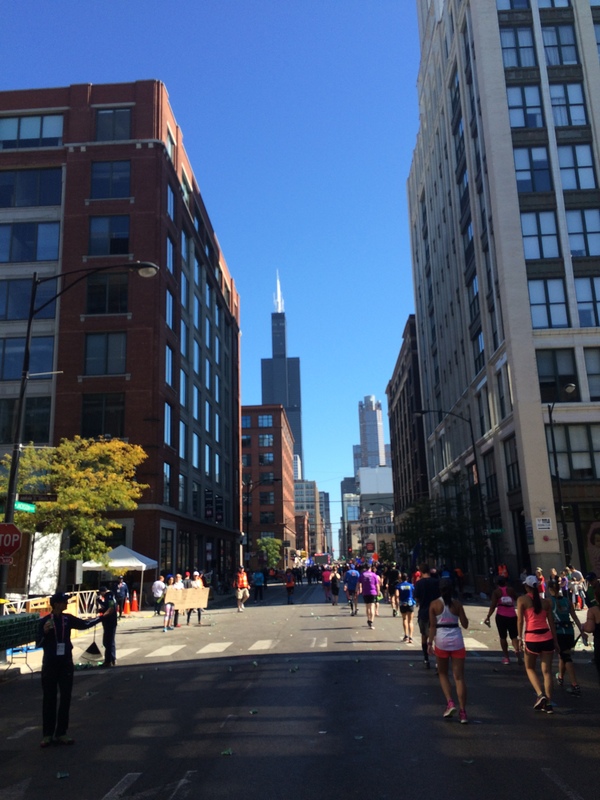 The sight of the Willis Tower getting closer was what kept me going in the 17th mile. It provided me with a nice distraction. Boy did I need it as fatigue was setting in. See the black board at the turn? This was a place where, if you had friends and/or family record a message for you, it would be displayed. I didn’t see anything as I got close. So, who knows if that board actually worked or if it only worked for the faster runners. 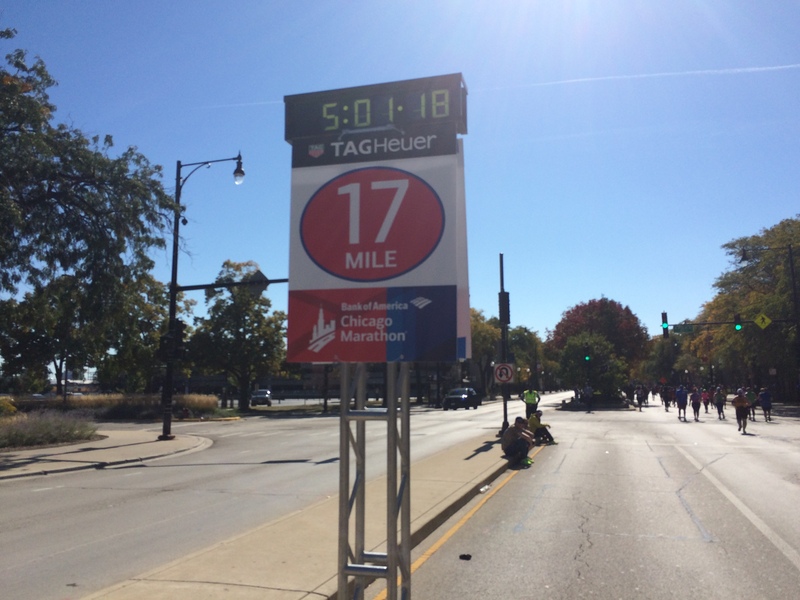 Apparently, I was just over 15 minutes in the 17th mile. In mile 18, I slowed down. I was feeling the tiredness and took a few run intervals off in this mile. By this point, I was so ready for the race to be over. I was tired and the heat was rising. However, I was able to convince myself to take no more than one or two run intervals off. I couldn’t quit on the race just yet. I was still on track for a sub 6:30:00 finish. So, I had to keep going. 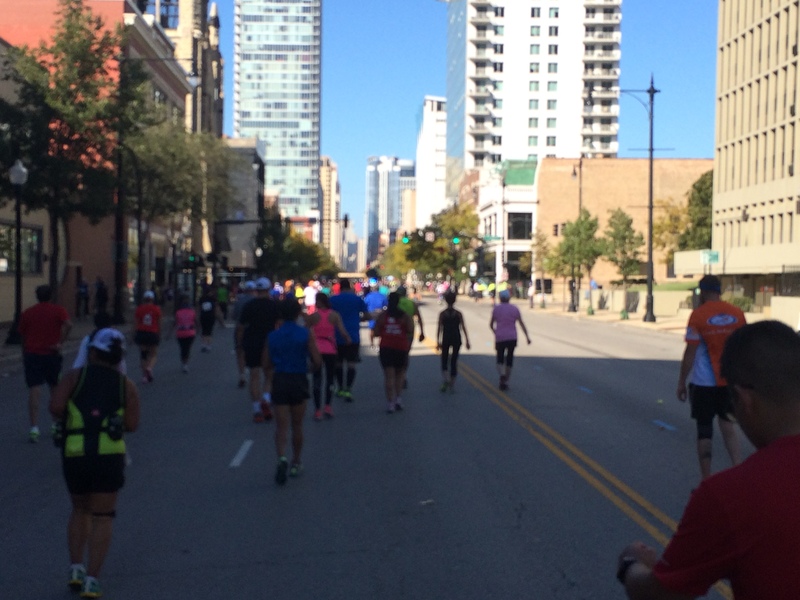 I was starting to feel a second, third, or fourth wind in mile 19. I got back to running almost all of my run intervals. However, my walk breaks were slowing down. I only had 7.2 miles to go! By this point my PR seemed like it was lost. That was okay. I was still on track for that sub 6:30:00 finish. 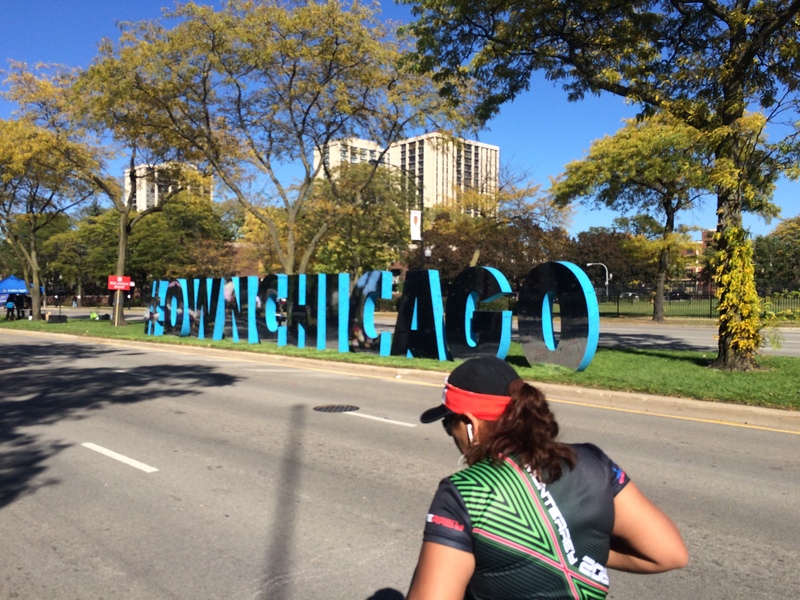 In mile 20, we went through a section of town called Pilsen. This is the Hispanic community of Chicago. I felt right at home among the Mexican flags. Mexico played the USA in soccer at the Rose Bowl the week before. I had no idea who won. The Mexican community ROCKS! There were lots of fun things to keep me distracted! 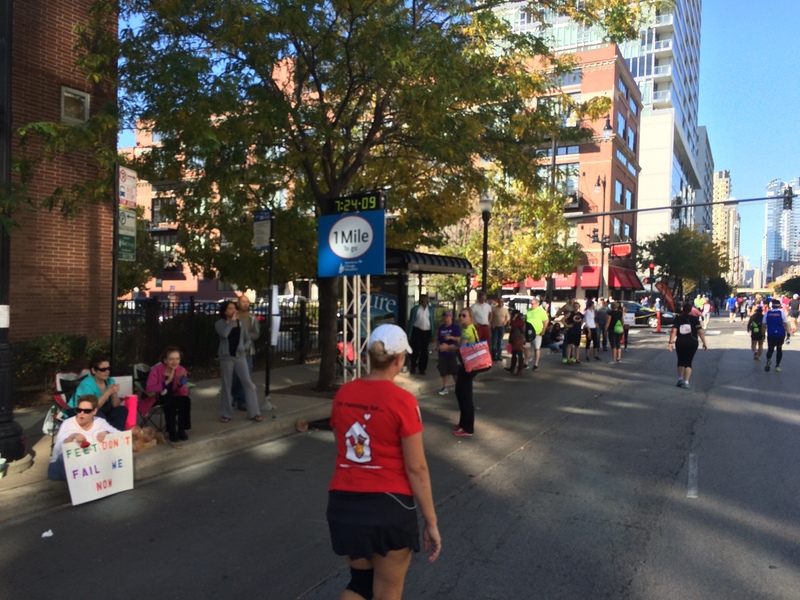 It took me around 16 minutes to get through mile 20. If I wasn’t so tired, I would have been thrilled with my time. 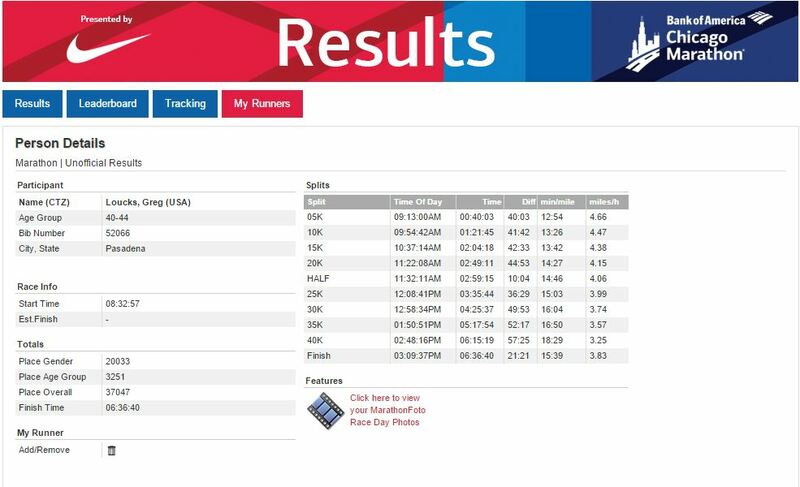 I was still in range for a sub 6:30:00 marathon time! 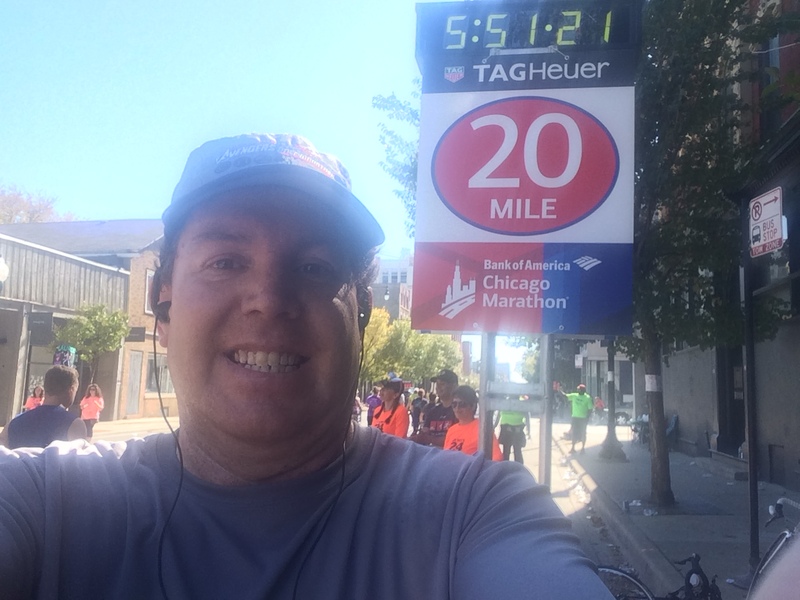 If you’d have told me before the race I would cross the 20 mile marker in under 5 hours, I would have been so happy. By this point, my feet were starting to hurt. Each run interval seemed to take forever. So, in mile 21, I altered my running to 15 seconds (which turned into 20 most of the time) and walk out the rest of each 2 minute segment. It looks like I finished the 21st mile in around 16 minutes. This was the last good mile for me. 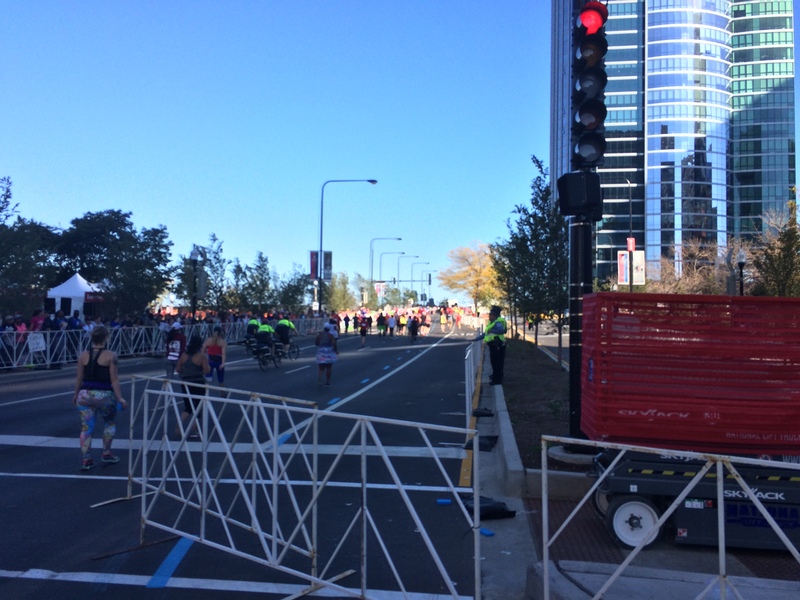 Mile 22 is where the race came off its wheels for me. 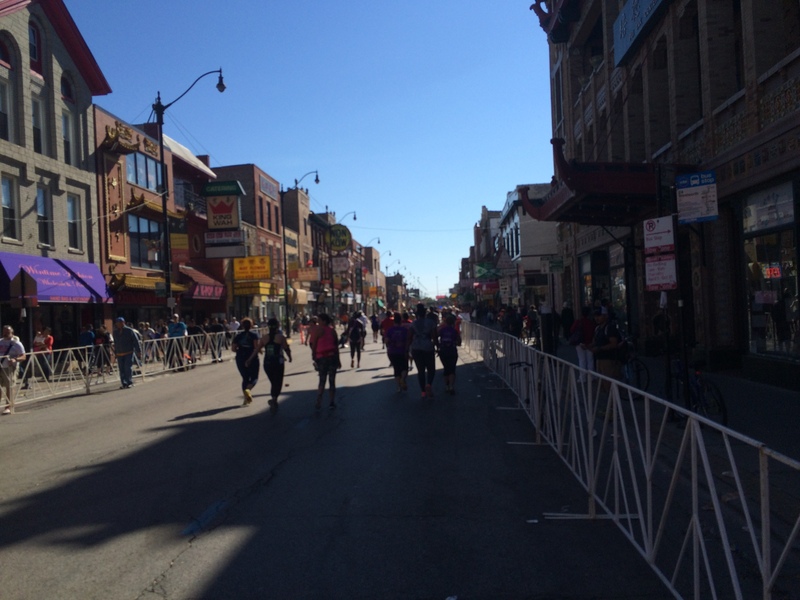 By the time I got into Chinatown, my sub 6:30:00 race was almost completely over. 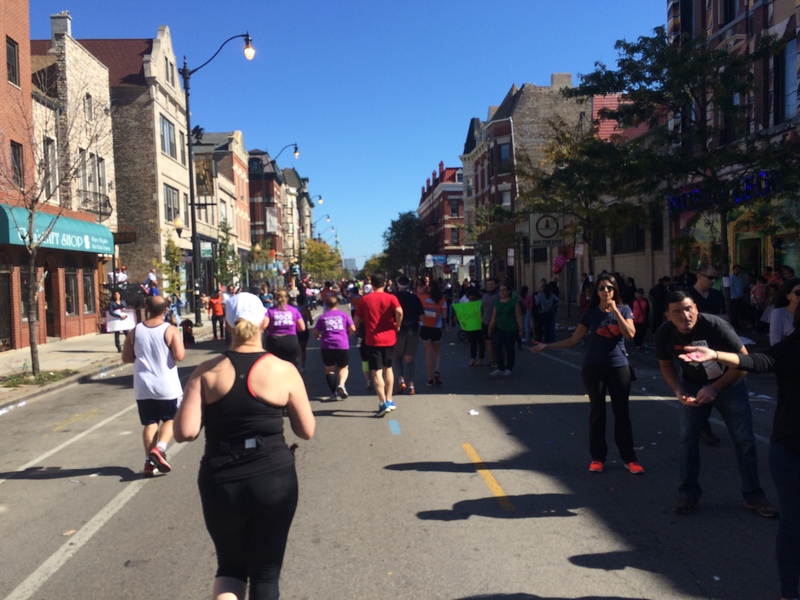 Somewhere in the first half of mile 22, I felt the familiar pop of blisters popping. It was just like when I started running at the 23 mile marker of the Los Angeles Marathon earlier this year. My feet were hurting during miles 20 and 21. However, I just had to get that sub 6:30:00 finish. So, I shortened the run interval in hopes I cold get to the finish. However, when the blisters popped, my feet were in major pain. Some steps felt like I was walking on glass. Not fun. Not fun at all. 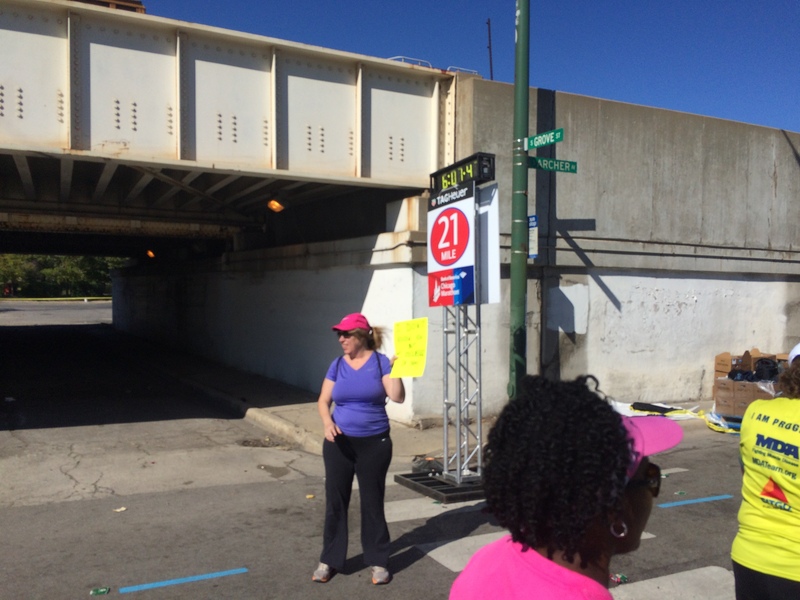 There was no picture of the mile 23 marker because I felt entirely defeated. Miles 23 and 24 were probably the most difficult of the entire race. I contemplated quitting several times. I wasn’t going to be an official finisher, I was in pain, and just plain exhausted. So, why continue? I thought about texting my wife a few times, but didn’t. All I wanted to do was lie down on a bed and sleep for a couple hours. What kept me going? I thought of all the people who donated to my charity for this race. I thought about the kiddos and families who I had helped by raising money. I just couldn’t stop. I had to find a way to finish. I told myself to just keep walking. By the time I got to the 24 mile marker, my sub 6:30:00 marathon was officially over. If I could have run, I might have just made the cutoff time. 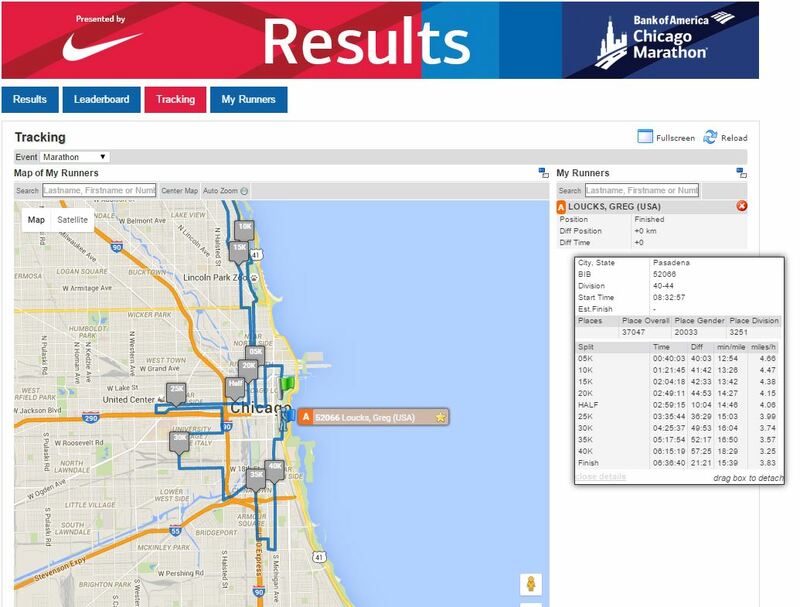 This was the official hash tag for Nike with the Bank of America Chicago Marathon. Right about this place, there was one guy who was talking with some of the spectators whom he knew. He told them he couldn’t talk because he had 30 minutes to finish 2 miles. So, off he went. It’s really hard to hear things like that when you don’t feel like you can run. 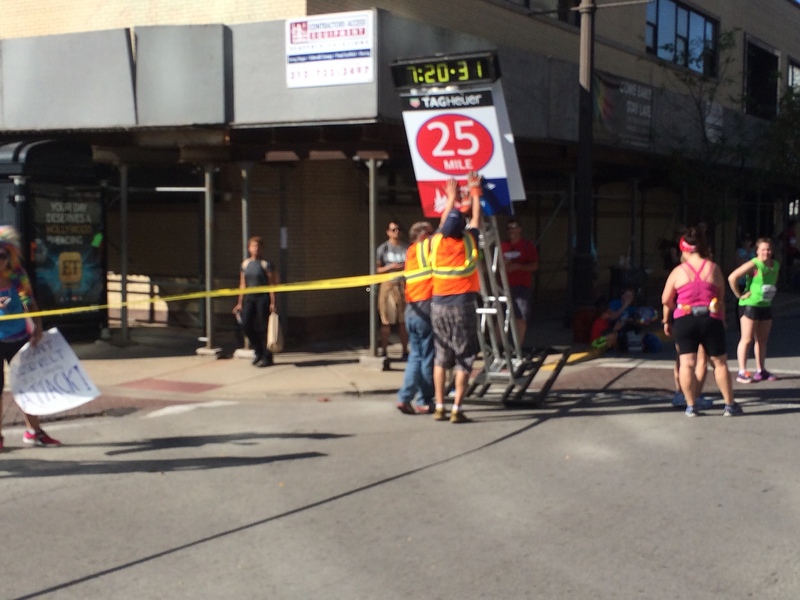 By the time I got to the end of mile 25, they were starting to tear the course down. I had to try to run some more. I was 1.2 miles from the finish. I had to try. Miles 23, 24, and 25 were all finished in around 20 minutes. I knew I’d be about 10 minutes late if I kept walking. I have no idea where the thoughts to try running came from. However, I just had to get to that finish line. I wanted the race to be over and it wouldn’t be until I got to the finish. I LOVED seeing this! 1 mile to go! There would be another sign like this with a half mile to go! 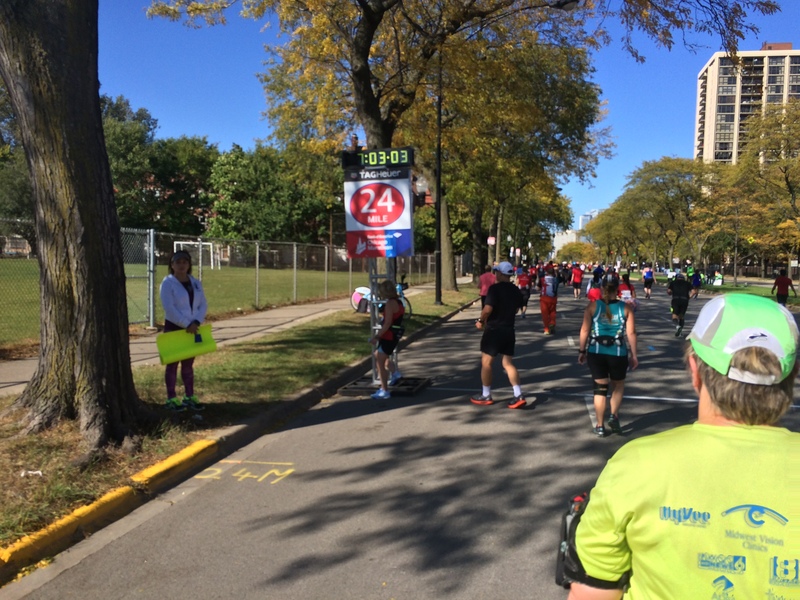 There was no mile 26 marker. I’m assuming that they had already taken it down. However, this is the final hill of the race. I walked the thing because I was tired and the 6:30:00 mark had already come and gone. At the top of the “hill” it was all downhill to the finish! I grabbed a quick picture and tried to run some. The finish line was so close! As I got close to the finish line, I saw this. 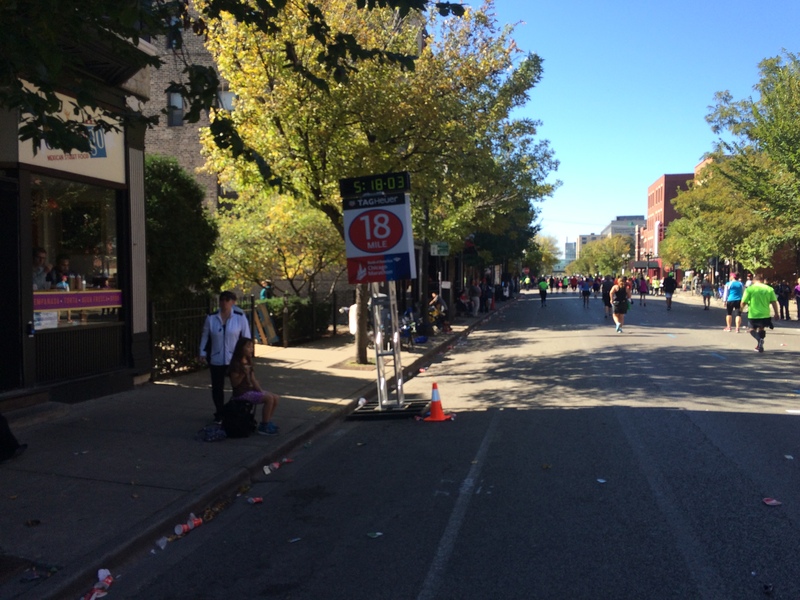 They had closed off the finish line and we were routed to the right. So, I stopped running long enough to grab a quick picture of the finish line. There would be no Marathonfoto of me crossing the line. There was not moment for me to thrust my hands in the air in celebration of finishing 26.2 miles. There was only a small handful of people out to cheer us back of the backers on. So, there was no roaring crowd or glory. All I had was the satisfaction of finishing all 26.2 miles. My unofficial time? 6 hours, 6 minutes, 40 seconds. I was 6 minutes and 40 seconds too slow to be an official finisher. However, I did get a finisher medal. As we were walking around the finish line area and back into the finisher’s chute, all of us were wondering if we’d get a medal. One lady next to me had a friend waiting for her. Her friend greeted her with a huge hug and big smiles of congratulations. All the lady next to me wanted to know if she would get a medal. She was only 2 minutes off the mark to be an official finisher. When we saw the medals, she has a huge sigh of relief. They had a full water bottle to hand us and a cooling towel. I’m not sure what else they might have had. I wanted to make sure I could get my stuff from the gear check. Thankfully, it was still open. So, I got my stuff! Yay! After that, it was time to find a place I might sit down. Not easy in the park. 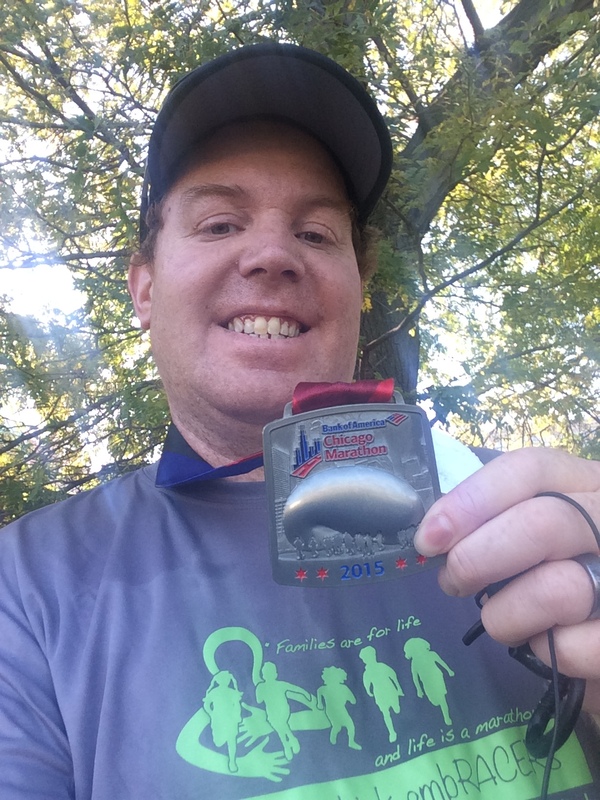 So, I found a shady spot where I could text my wife this picture to let her know I finished. Then, as sore as I was and tired as I was, it was time to walk to Girodano’s for lunch/dinner. I was so hungry and wanted anything that’s not runner food. By the end of 26.2 miles, I was tired of water, Gatorade, and my Cliff Bloks, etc. I wanted other food. 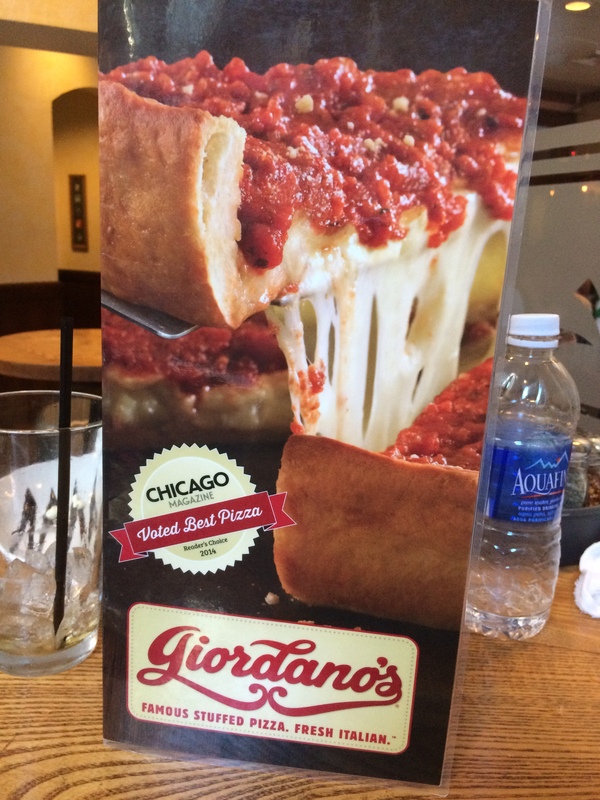 When I got to Giordano’s, the line was crazy. The person in front of me was told they would have over an hour wait. Since I was by myself, I was asked if I minded a high table and chair to get in right away! Absolutely! When I ordered, the waitress said the pizza would take at least 45 minutes. 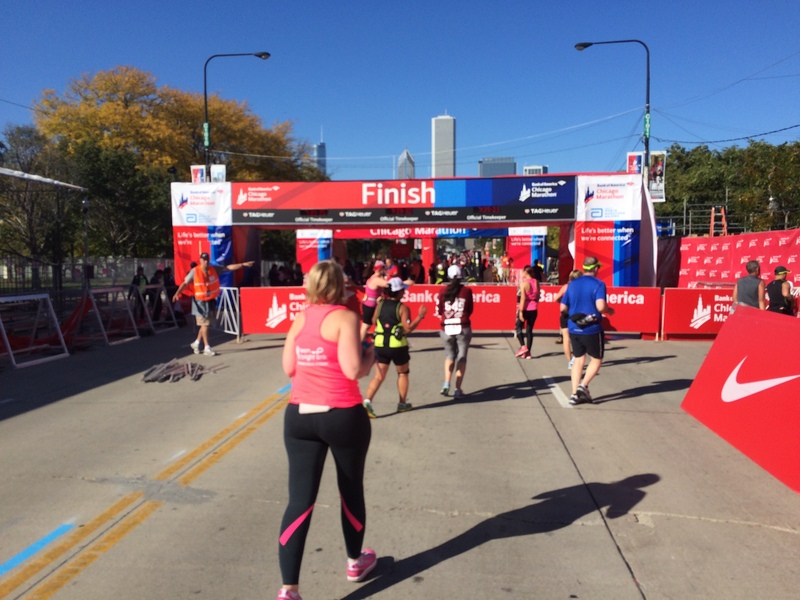 I told her…”I just finished 26.2 miles. I’m good with sitting and waiting for food.” She did ask if I wanted an appetizer because of the wait. 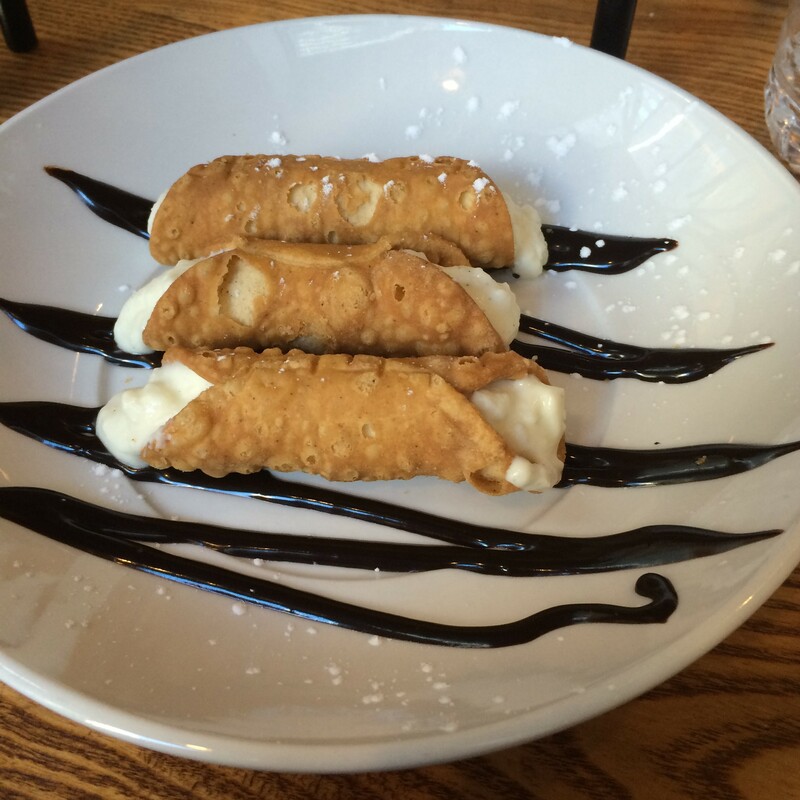 Who needs an appetizer when you can get cannoli’s! It sounded so much better than the regular appetizers. Yes, they were amazing! After 6 and a half hours plus of runner food, this was heavenly! 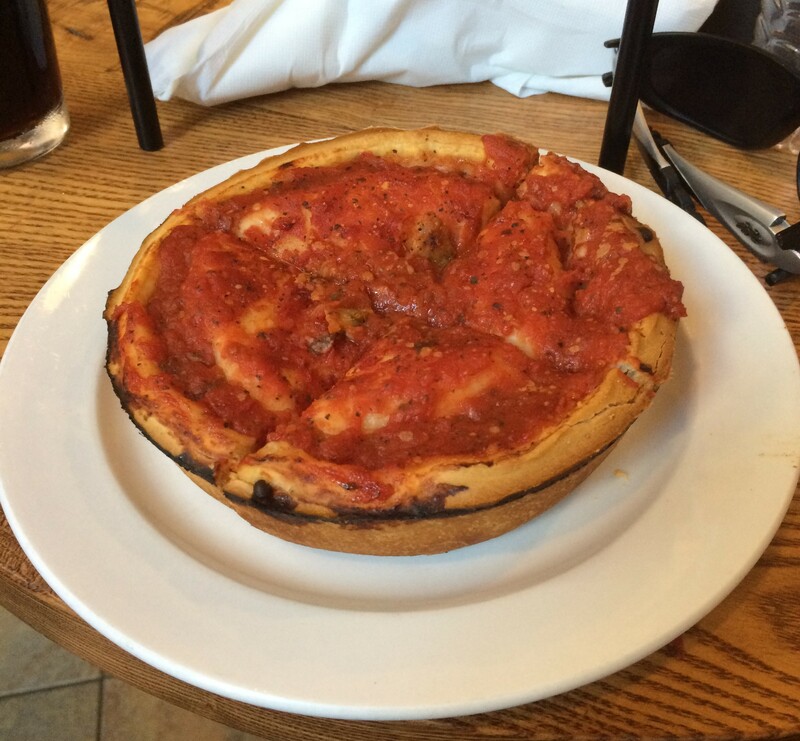 I had the individual size deep dish with apple-chicken sausage. 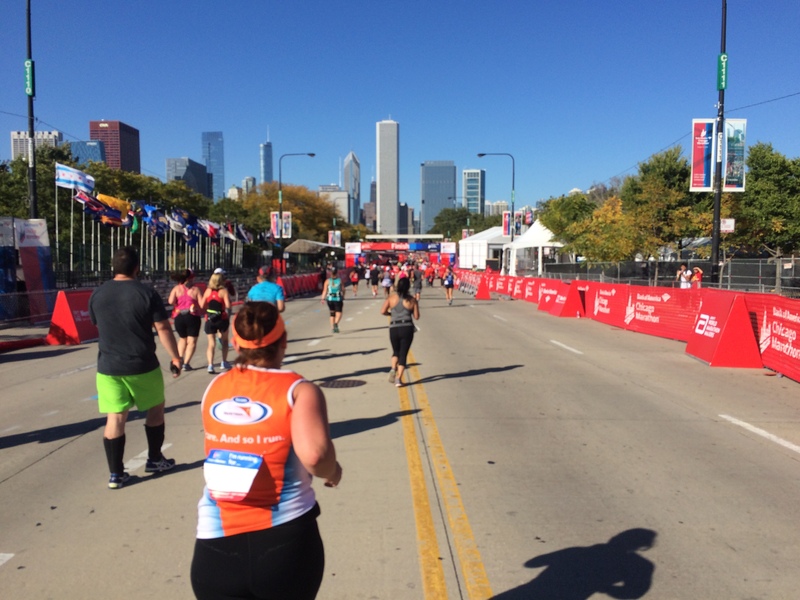 There was no better way to celebrate 26.2 miles than with genuine Chicago pizza in Chicago! The pizza was LEGENDARY! What surprised me is that one piece of the 4 filled me up. 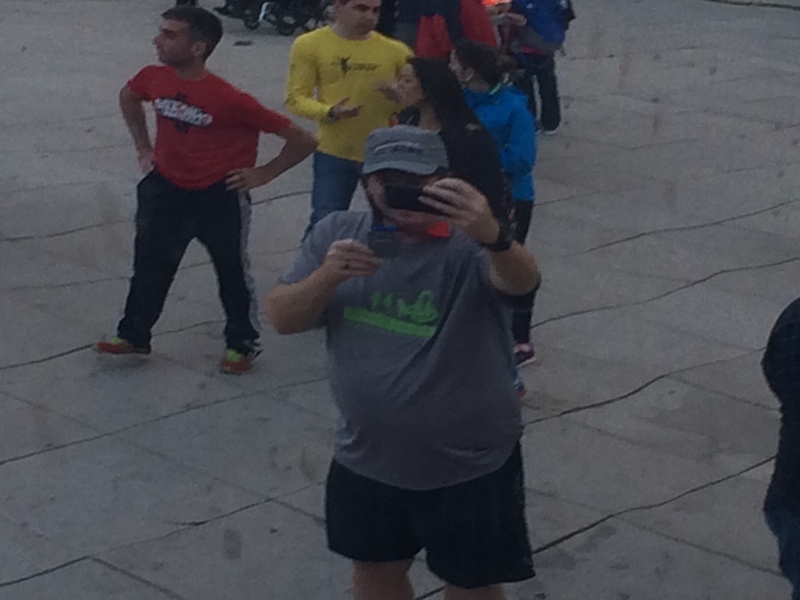 Then, it was time to head out to “The Bean” in Millennium Park. It was so cool to see this thing after seeing it in so many television shows and movies. I tried to get a pic off The Bean. However, that didn’t turn out so good. So, I finally found a good spot. This is the picture that caused so much controversy on Facebook. Strange. By the time I took this picture. I was completely over my disappointment of finishing over 6 hours 30 minutes. By this point, the fact that I had just run my third full marathon and that it was around 20 minutes faster than the Los Angeles Marathon had set in. I was happy with getting to the finish line. Even if my feet were killing me. I had just finished a World Major Marathon! Here’s one look at my splits. This one is better. 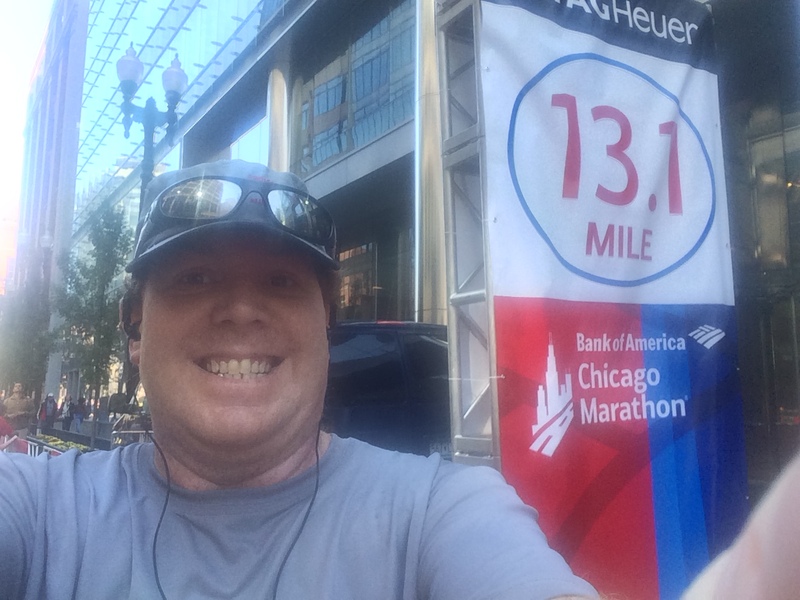 I finished with an average pace of 15:39 per mile. That means I was 39 seconds per mile off the pace needed to be an official finisher. Not too shabby for this back of the packer who finished the last 4.2 miles with popped blisters on both feet. 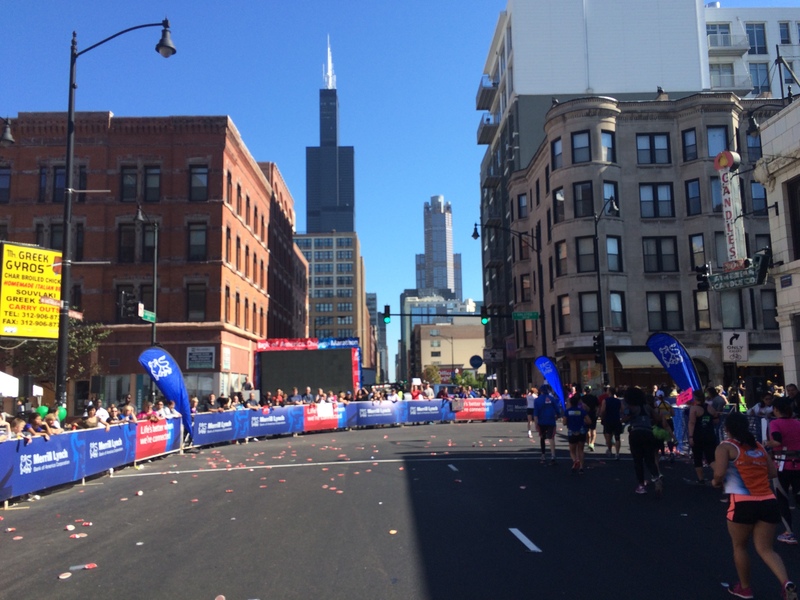 Something that I do wonder about…the race program said they were closing the finish line at 3 pm. The program said that there would be two waves starting. Each was expected to take 15 – 20 minutes to clear. If you look at my start time, you’ll see something interesting. I started at almost 8:33 am. So, if I had finished the race in exactly 6:30:00, I would have come to the finish at 3:02:57 pm…almost 3 minutes after they shut the finish line. Of course, that assumes they closed exactly at 3:00:00 pm. 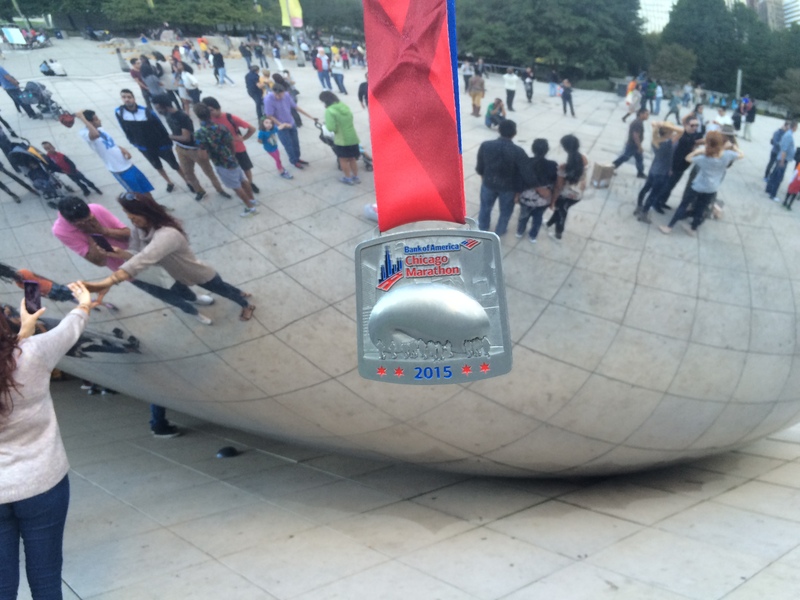 If you’re going to run a marathon, this is a fantastic race to run! The course is as flat as advertised. Everything was really organized. 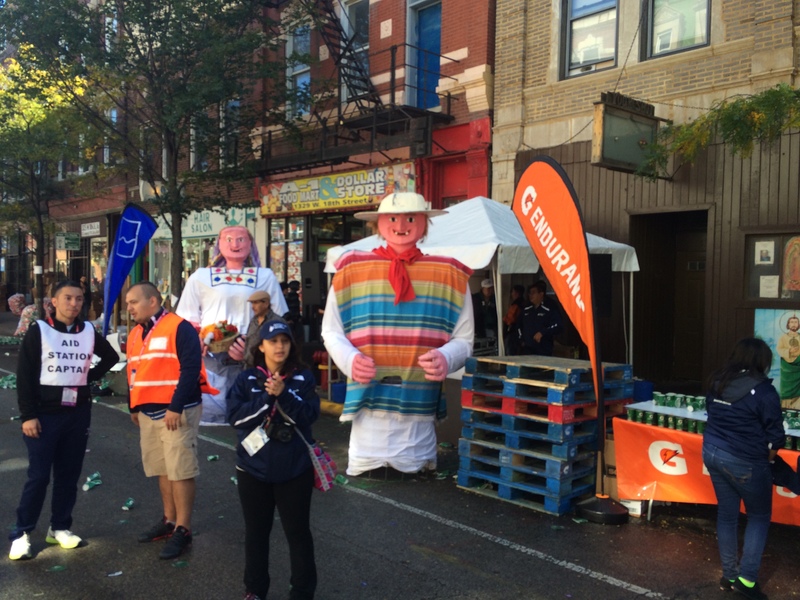 I loved the fact that they had their Gatorade/Water stations consistent throughout the race. Gatorade came first. There was a small gap. Then, the water. They had stations on both sides of the road. It was like this at EVERY single station on the course! 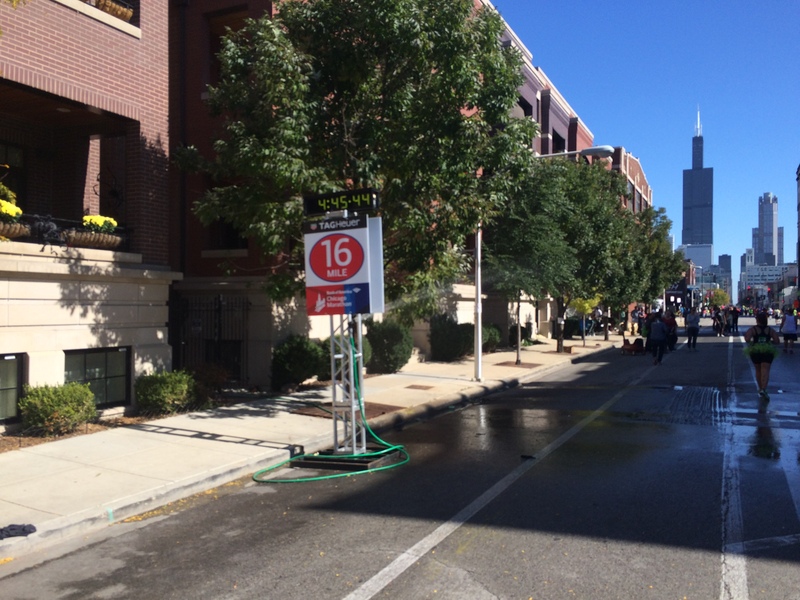 They were handing out water all the way into the last mile. I think the last station was right before the 800 meters to go sign! As a back of the packer, I was thrilled that every station had water and Gatorade when I arrived. The crowd support is off the charts. Although, the last few miles the crowds were pretty sparse. You could tell that there were way more people watching earlier in the race. I was impressed with all those that stuck it out to the bitter end. 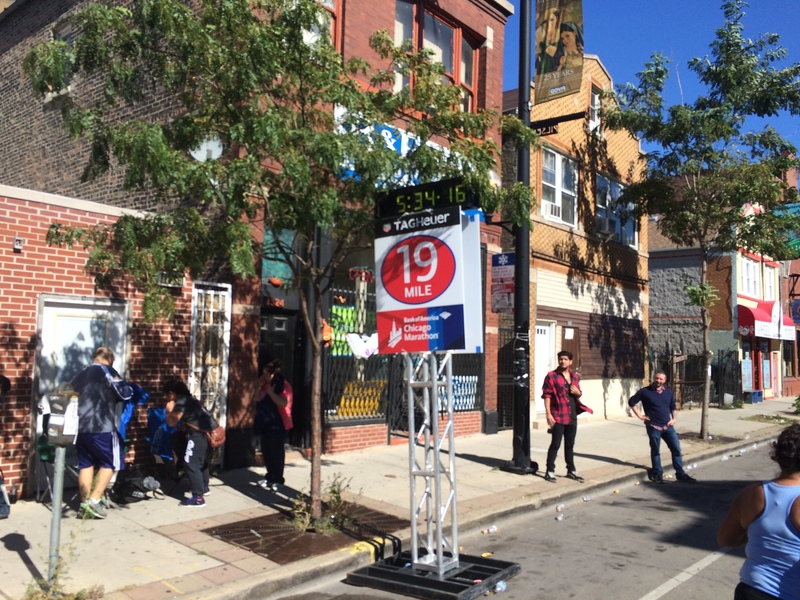 Chicago is a town that totally supports this race! 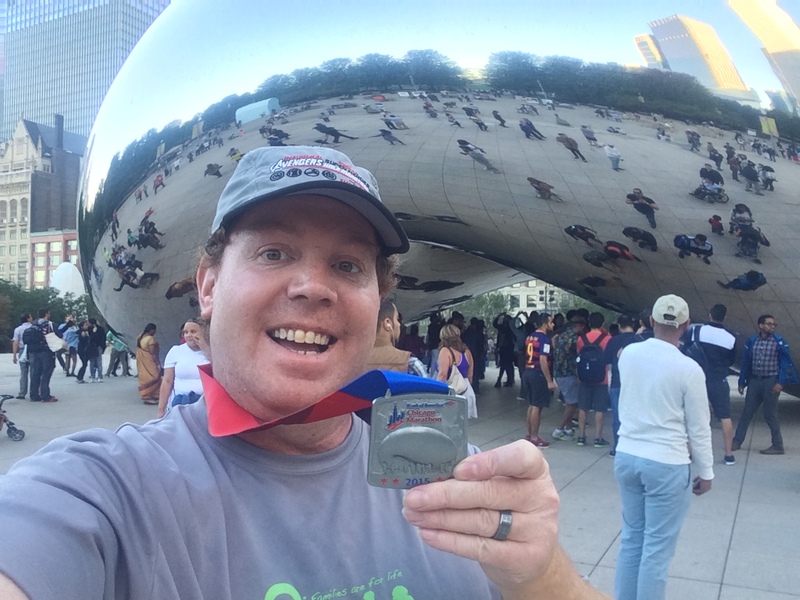 Celebrating My 3rd Full Marathon in the Windy City! congrats on finishing and writing a great recap! the water stops really sounded awesome. Thanks! Marathon #3 is in the books!